Volvo S90 Performance, Engine, Ride, Handling | What Car? Volvo has used its new Power Pulse technology on the S90's D5 engine; this uses compressed air to help the turbocharger kick in more promptly. The result is superbly urgent acceleration from low revs, and this doesn't fall away as you push on. The least powerful D4 engine doesn’t feel quite as urgent, but still has the mid-range shove to whisk you easily up to motorway speeds before settling into a relaxed cruise. It's just a shame the standard eight-speed automatic gearbox on both engines can sometimes dither, hindering your progress. If you prefer petrol power, there’s a 187bhp T4 engine available although we haven't tried it yet. Alternatively, you can opt for the T8 Twin Engine. This doesn’t lump another turbocharged petrol engine in the boot; instead, you get a battery pack and an electric motor powering the rear wheels. This reduces CO2 emissions and allows you to run for up to 28 miles on electric power alone if you charge the battery. The other advantage of battery power is performance – the T8 gets from 0-62mph in less than five seconds. Just remember: the faster you go, the quicker the battery gets drained. On a typical commute with some motorway miles, this is likely to drop to around 20 miles or even less. The T8 should shuffle between power sources without disturbing you too much. You don’t really notice the engine start and you rarely notice the car switching from electric to engine power and back again. The S90 is an extremely quiet cruiser. Its engine only becomes strained above 4000rpm, and the gearbox is smooth once you're on the move. We did find that the diesel engines are surprisingly clattery when cold, however. 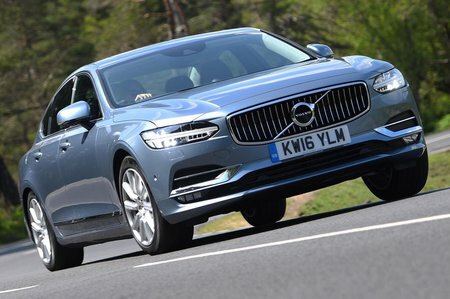 Our experience with other T8 Volvos suggests the S90 hybrid will be virtually silent when running on electricity, while the car’s petrol engine will be more refined than the diesels. There's almost no wind noise, even on the motorway, and road noise is well contained - although it is slightly worse over coarse surfaces with the larger wheel options fitted. Ride comfort is crucial in large executives, so it’s disappointing to find the S90 doesn’t deal with bumps that well with the standard suspension fitted. We’d therefore go for the optional rear air-suspension with front adaptive dampers; these make the S90 waft along pleasantly at high speeds. Around town, there’s a little more fidget than you’d feel in a BMW 5 Series, and large ruts send a thump through the car. R-Design models come with a lower-suspension set-up that makes the ride a bit harder. Volvo has certainly taken a more relaxed approach when it comes to handling – the S90 is more like the lethargic Audi A6 than the precise BMW 5 Series. It remains fairly upright though tight bends, but never feels particularly eager to change direction and the steering doesn't provide much feedback. That said, the D5-engined model gets four-wheel drive as standard, so there's plenty of traction when pulling away and accelerating out of slow corners. R-Design also provides a slightly tighter driving experience, but it’s ultimately not worth the compromise for the ride comfort. It’s worth noting that the heavy battery in the T8 will make it feel less agile than the regular models – something that could be a disappointment if you want a high-performance saloon. We also found that the steering wheel could occasionally writhe in your hands slightly if you accelerated hard from a standstill in other T8 models; it may be four-wheel drive, but the front wheels receive more than three times as much power as the rear ones.